This is a list of Capsicum cultivars belonging to the five major species of cultivated peppers (genus Capsicum): C. annuum, C. chinense, C. baccatum, C. frutescens, and C. pubescens. Due to the large and changing number of cultivars, and the variation of cultivar namings in different regions, this list only gives a few examples of the estimated 50,000 pepper varieties that exist. There are five major species of cultivated Capsicum, C. annuum, C. chinense, C. baccatum, C. frutescens, C. pubescens, and within those species are several "taxonomic varieties". Because of the ability of many of species to cross and generate inter-specific hybrids, albeit with low success, there are also what is referred to as "complexes" within the genus Capsicum of closely related and sexually compatible species. This includes the Capsicum annuum complex, which consists of C. annuum, C. frutescens, and C. chinense. Capsicum chinense, which includes all of the Habaneros, Scotch Bonnets, Trinidad Scorpions, the Bhut Jolokia and the Carolina Reaper. Capsicum frutescens, which includes the Tabascos and many of the peppers grown in India; sometimes not distinguished as a species separate from C. annuum. Capsicum pubescens, which includes the Rocoto and Manzano pepper, and are distinctive plants in having violet flowers, black seeds and hairy dark green leaves and grows as a large, multi-stemmed vine up to 5 meters long. Ancho / Poblano - These are the same type. They differ in whether the fruit is eaten fresh or dried. Bell Pepper - One of the most common sweet peppers. Cayenne - Popular in Cajun cuisine. Jalapeño - Popular in Texas and Tex-Mex cooking. New Mexico chile - Popular in New Mexico, but also throughout the Southwestern United States, El Norte, and the Valley of Mexico. Typically referred to as red or green chile in New Mexican cuisine. Includes Hatch, Rio Grande, Española, Big Jim, Sandia, Anaheim, 6-4, and other varieties. Serrano - Popular in Puebla and Hidalgo. Shishito - Popular in East Asia, called a groundcherry pepper in Korean cuisine. The species and varieties include many economically important cultivars with different shapes, colors, and flavors that are grown for different purposes, such as spices, vegetables, and herbal medicines. Some confusion has resulted from the legal term "plant variety", which is used interchangeably with "cultivar" (not with "taxonomic variety"). The terminology around a cultivar also includes terms such as heirloom, open-pollinated, self-pollinated, and hybrid. Heirloom varieties are typically those that have been selected and grown historically with seed saved every year, and are still maintained today in similar fashion, such as the blocky-type California Wonder. Open-pollinated varieties are those that are maintained without strict barriers to prevent out-crossing and then seed is collected at and stored from each harvest such as the lamuyo-type Marconi Yellow. While open-pollinated varieties are typically true-to-type, there may be occasional out-crossing to other Capsicum varieties that may introduce some heterogeneity. Self-pollinated varieties are similar to open-pollinated varieties in that they are true-to-type and seed is collected at and stored from each harvest, but measures are taken to minimize out-crossing. This may involve placing a barrier such as a mesh bag or cage over the plant to prevent pollinators from reaching flowers, ensuring that the plant has "selfed". This is how much seed intended for home-garden use is produced, like the cultivar Early Jalapeño. These three types of cultivar seed production are all similar in that only one parent is used and the seed are produced generally through selfing. Hybrid varieties take advantage of a phenomenon called heterosis or hybrid vigor, which occurs in pepper. To generate a hybrid variety, two self-pollinated varieties are intentionally crossed, and all seed from this cross are collected. The new hybrid variety typically is more vigorous than either of the two parents contributing to traits such as higher yield. Hybrid seed if saved will not produce a homogeneous set of plants the next generation, meaning that the two parents will need to be crossed again to generate more hybrid seed. This method is used to produce hybrid Capsicum cultivars such as the blocky-types Double-Up and Orange Blaze. Much of the commercial pepper production uses hybrid varieties for their improved traits. Capsicum annuum, native from southern North America through Central America to South America, has been cultivated worldwide for over 400 years. Its fruit forms are varied, from large to small, sweet to sour, and very hot/pungent to bland. Despite being a single species, C. annuum has many forms, with a variety of names, even in the same language. Official names aside, in American English, any variety lacking heat is colloquially known as a sweet pepper, and those sweet peppers that have a blocky-shape are referred to as bell peppers. A variety that produces capsaicin is colloquially known as a hot pepper or chili pepper. In British English, the sweet varieties are called "peppers" and the hot varieties "chillies", whereas in Australian English, the name "capsicum" is commonly used for bell peppers exclusively and "chilli" is often used to encompass the hotter varieties. The plant is a tender perennial subshrub, with a densely branched stem. The plant reaches 0.5–1.5 m (20–60 in). Single white flowers develop into the fruit, which is typically green when unripe, but may lack chlorophyll causing a white color. Ripening fruits usually change to red, although some varieties may ripen to yellow, orange, peach, brown, or purple. The species are grown in temperate climates as an annual, but they are especially productive in warm and dry climates. Anaheim Anaheim United States 500–2,500 SR 15 cm (5.9 in) A mild variety of New Mexico chile. It was later brought to California from New Mexico by Emilio Ortega in the 1900s. Often it is used for chile relleno. When mature, it takes on a red color and is referred to as a colorado. Banana Waxy 0–500 SR 15 cm (5.9 in) Often it is pickled and used as an ingredient in sandwiches; its piquancy is not very hot. Its shape and color resemble a banana. Bird's Eye Small hot Southeast Asia 50,000–100,000 SR 4 cm (1.6 in) A Southeast Asian cultivar known by many local names, but generally it is called Thai chili in the United States. It has thin fruit with a pointed tip. Hungary 5,000–10,000 SR 5–7 cm (≈ 2–3 in) Grows in a conical shape with a slight curve near the tip. Starting from green, they ripen first to a slightly shiny deep purple to black which is only skin deep; when you slice one open, the thick flesh of the interior is green. As it continues to ripen, it morphs to red. Cascabel Mexico 3,000 SR 2.5 cm (1 in) The small, round fruit are usually dried, and have a distinct, nutty flavor. The name, Spanish for "rattle" or "jingle bell", derives from the rattling noise made by the seeds inside the dried pod. Cayenne (Red) Cayenne French Guiana 30,000–50,000 SR 13 cm (5 in) This long, thin fruit was transported by the Portuguese to China and India, where it is used widely. Often it is dried and ground into powder. Cherry Pimiento 3,500 SR 2.5 cm (1 in) Named for the fruit it resembles, this cultivar's fruit is small, red, and round. It is typically used fresh, or pickled and jarred, and is often used to stuff green olives. It is also called pimento. Cheongyang long, hot Korea 10,000 SR a medium-sized chilli cultivar, named after Cheongsong and Yeongyang Counties when developed by Dr Yoo Il-Woong(유일웅), by hybridizing local Jejudo chilli with Bird's eye chilli. Chilaca Pasilla 1,000–2,000 SR 15 cm (5.9 in) Popular in Mexican cuisine, it is almost always encountered dried; in this state, it is referred to as a pasilla. The pasilla has a dark brown color and a smoky flavor. Chiltepin Chiltepin 50,000–100,000 SR 0.5 cm (0.20 in) This small, hot fruit is often eaten by birds. The plant is thought to be the ancestor of the cultivated C. annuum peppers. Evidence indicates it has been consumed by humans as far back as 7,500 BC. Cubanelle 1–1,000 SR 13 cm (5 in) Medium in thickness, the tapered fruit is green when unripe, but turns red when mature. Often it is fried in Italian cooking. 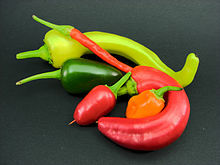 Dangjo Korea Light green or bright yellow chili peppers with mild heat. De árbol Mexico 15,000–30,000 SR 8 cm (3.1 in) This slender-fruited cultivar is grown primarily in Mexico, its name is Spanish for "from a tree". Fresno Fresno United States 2,500–10,000 SR 9 cm (3.5 in) Similar to the jalapeño, but with thinner walls, it is generally used ripe, and has a higher vitamin content. Frequently it is used in ceviche, and is one of the most frequently used chilis in salsa. Friggitelli (Peperoncini) Waxy Italy 100–500 SR 8 cm (3.1 in) Sweet-tasting and mild, used extensively in Italian and Greek cuisine, very frequently pickled. Guntur Sannam 35,000–40,000 SR It is well known as a commercial crop used as a condiment, culinary supplement, or vegetable. Hungarian Wax Waxy 2,500–8,000 SR This wide, medium-hot variety is used in Hungarian cuisine, frequently pickled. Also it is commonly dried, ground, and presented as "paprika". Jalapeño Jalapeño Mexico 2,500–8,000 SR 9 cm (3.5 in) Very popular, especially in the United States, it is often pickled or canned. A smoke-dried ripe jalapeño is referred to as a chipotle. Korean chili Korea 1,500 SR 7.6–10.2 cm (3–4 in) Also known as "Korean Dark Green", "Korean Long Green", "Korean Red" or "Korean Hot"
Medusa Ornamental It is a sweet, ornamental chili pepper which grows upright and has brightly colored fruit. Mirasol Mexico 2,000–5,000 SR The dried form of the Mirasol chili is called guajillo, and is used to make a red sauce used for tamales. Mulato Poblano Mexico 2,500–3,000 SR 10 cm (3.9 in) Grown in Mexico, the mulato is a mild to medium chili pepper, closely related to the poblano (ancho), and usually sold dried. NuMex peppers Ornamental United States The Chile Pepper Institute at New Mexico State University has developed a number of unusual chile cultivars. NuMex Twilight peppers pictured. Peter Pepper Ornamental United States and Mexico 5,000–30,000 SR 8–10 cm (3.1–3.9 in) Rare, heirloom-type hot pepper cultivated for its unique shape. Peperoncino Cayenne Italy 15,000–30,000 SR Generic Italian name for hot chili peppers, specifically the cultivars of the species Capsicum annuum and Capsicum frutescens. Piment d'Espelette Pimiento Basque Country (French part) 1,500 - 2,500 SR Fresh fruits, plants and seeds are known as "Gorria", dried fruits are called "Piment d'Espelette". "Gorria" is the Basque word for "red". Grown in Espelette since ca. 1650. Poblano Poblano Mexico 1,000–2,000 SR 13 cm (5.1 in) The large, heart-shaped, dark green fruit is extremely popular in Mexico, often to make chile relleno. When dried, it is referred to as an ancho or mulato. Prik Kee Nu Small Hot Thailand 50,000–100,000 SR 3 cm (1.2 in) One of many cultivars called Thai pepper, it has very short fruit, and is very hot. Thai: พริกขี้หนู, RTGS: phrik khi nu, IPA: [pʰrík kʰîː nǔː], literal: Mouse/rat dropping chili. Puya Mexico 5,000 SR Capsicum annuum L., hot, medium-size, green to red, and tapered Also known as a 'Pulla'. Santa Fe Grande Fresno The Santa Fe Grande is a very prolific variety used in the Southwestern United States. The conical, blunt fruits ripen from greenish-yellow, to orange-yellow to red. The peppers grow upright on 24-in plants. Santa Fe Grande has a slightly sweet taste and is fairly mild in pungency. Serrano Serrano Mexico 10,000–23,000 SR 5 cm (2.0 in) The thin, tapered fruit turns red when mature. Due to its thin skin, it does not need to be peeled before use. Bishop's Crown 10,000–30,000 SR 6 cm (2.4 in) C. baccatum strain from Barbados. Medium hot pods have a unique shape which resembles the hat of a bishop. Sturdy plants, can be grown as perennials. Also known as bishops hat, orchid, ají flor, monks hat. Lemon Drop 30,000–50,000 SR 4 cm (1.6 in) Very productive C. baccatum variety. Pods are thin walled and have a fruity taste with medium heat. Capsicum chinense or "Chinese capsicum" is a misnomer since all Capsicum species originated in the New World. Nikolaus Joseph von Jacquin (1727–1817), a Dutch botanist, named the species in that way in 1776 because he believed they originated in China. Most of the peppers of this species have a distinctive flavor and are similar in flavor to each other. Ají Dulce 0–50 SR It is a type of seasoning pepper. 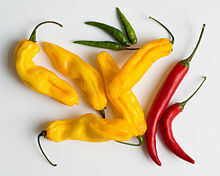 It refers to a specific variety of Capsicum chinense that is related to the habanero but with a much milder flavor. Bhut Jolokia Up to 1,500,000 SR 6 cm (2.4 in) This cultivar originated in Northeast India, and was once confirmed by Guinness World Records to be the hottest pepper. It is an interspecific hybrid, largely C. chinense with some C. frutescens genes. It is also known as naga jolokia and ghost pepper. Carolina Reaper United States 1,569,300–2,200,000  SR Extremely hot pepper, currently the Guinness book of world records holder as of August 7, 2013. Fatalii 125,000–325,000 SR 6 cm (2.4 in) Grown in central and southern Africa, it is very similar in appearance to and often confused with the devil's tongue habanero. Habanero 100,000–350,000 SR 5 cm (2.0 in) Once considered to be the hottest chili pepper, the habanero has been surpassed by other hot varieties, but it is nonetheless hotter than most commonly available cultivars. The habanero has a subtle, fruity flavour and a floral aroma. It is closely related to many other very hot peppers. Disseminated to China over 500 years ago by Spanish and Portuguese explorers, it became so much a part of Chinese cuisine, botanists who found it in China thought it was native to the area and thus named this species Capsicum chinense, based on the habaneros from China. Hainan Yellow Lantern 300,000 SR 5 cm × 3 cm (2.0 in × 1.2 in) Also known as the yellow emperor chili, it grows only in Hainan, China. NuMex peppers United States The Chile Pepper Institute at New Mexico State University has developed a number of unusual chile cultivars. NuMex Suave Orange peppers pictured. Scotch Bonnet 150,000–325,000 SR 5 cm (2.0 in) Named because of its resemblance to a Tam o' Shanter, this fruit is closely related to the habanero and is similarly hot. Due to its heat and distinct flavour, it is often used in Caribbean cuisine. Trinidad moruga scorpion Up to 2,000,000 SR Former World-record holder for hottest chili as of 2012. Trinidad Scorpion 'Butch T' Up to 1,400,000 SR Former world-record hottest chili. African Birdseye 50,000–175,000 SR 2.5 cm (1 in) Also known as piri piri, it is common in Portuguese, Mozambican, and Angolan cuisines. Kambuzi Malawi Kambuzi is a small, round chili pepper cultivar that is found in central region of Malawi, a landlocked country in southeast Africa. Siling Labuyo 80,000–100,000 SR 2.5 cm (1 in) A small, cone-shaped cultivar grown in the Philippines. Tabasco 30,000–50,000 SR 4 cm (1.6 in) Used in Tabasco sauce. The fruit is only used when it is a particular red color measured with “le petit bâton rouge”. Capsicum pubescens is among the oldest of domesticated peppers, and was grown as long as 5000 years ago. It is probably related to undomesticated plants that still grow in South America (C. cardenasii, C. eximium, and others). Canário Peru 30,000–50,000 SR 6.5 cm (2.6 in) Canário is a medium hot C. pubescens variety. Thick walled pods are dark yellow when fully ripe and have the size of a small apple. This South American strain trives well under cool growing conditions and can be grown as a perennial. Rocoto Peru, Bolivia 30,000–100,000 SR Also known as a Manzano or Locoto pepper, there are many Rocoto varieties. "Manzano" is the Spanish word for "apple", and describes the fruits' shape. ^ a b Contested as being the result of testing a single specimen and thus not establishing a consistent result for a cultivar. ^ "introducing the capsicum to the world". World Of Chillies. Retrieved 7 February 2015. ^ Jarret, Robert L. (2008). "DNA Barcoding in a Crop Genebank: The Capsicum annuum Species Complex". The Open Biology Journal. 1 (1): 35–42. doi:10.2174/1874196700801010035. ^ a b Dave DeWitt and Paul W. Bosland (2009). The Complete Chile Pepper Book: A Gardener's Guide to Choosing, Growing, Preserving, and Cooking. Timber Press. ISBN 978-0881929201. ^ "Capsicum frutescens L." Tropicos.org. Missouri Botanical Garden. Retrieved 19 Jul 2015. ^ a b "How are hybrid and open-pollinated vegetables different? | Oregon State University Extension Service | Gardening". extension.oregonstate.edu. Retrieved 2016-04-01. ^ Jr, Alfred W. Crosby (2003-04-30). The Columbian Exchange: Biological and Cultural Consequences of 1492, 30th Anniversary Edition. ABC-CLIO. ISBN 9780313095399. ^ "Pepper - Glossary - Cooking libraries - Cooking and recipes - Food & drink". Waitrose.com. Retrieved 2010-04-11. ^ "Chilli - Glossary - Cooking libraries - Cooking and recipes - Food & drink". Waitrose.com. Retrieved 2010-04-11. ^ Nations, Food and Agriculture Organization of the United (1990-01-01). Protected Cultivation in the Mediterranean Climate. Food & Agriculture Org. ISBN 9789251027196. ^ Cite error: The named reference Cornell University Vegetable Varieties was invoked but never defined (see the help page). ^ "Bird's Eye Chili Peppers". Chili Pepper Madness. 2013-09-27. Retrieved 7 February 2015. ^ "Black Hungarian Pepper". PepperScale. 2016-03-29. Retrieved 24 April 2018. ^ a b c d e f g h i j "The Chile Pepper Institute Merchandise Catalog" (PDF). The Chile Pepper Institute. New Mexico State University. Retrieved 21 May 2015. ^ Park, Mi-Sung; Zhu, Ya Xin; Pae, Hyun-Ock; Park, Seong Hoon (9 March 2016). "In Vitro and In Vivo α-Glucosidase and α-Amylase Inhibitory Effects of the Water Extract of Leaves of Pepper (Capcicum Annuum L. Cultivar Dangjo) and the Active Constituent Luteolin 7-O-Glucoside". Journal of Food Biochemistry. 40 (5): 696–703. doi:10.1111/jfbc.12252. ^ "Mirasol Chili Peppers". Chili Pepper Madness. 2013-09-22. Retrieved 5 February 2015. ^ Jean Andrews (2005). The Peppers Cookbook: 200 Recipes from the Pepper Lady's Kitchen. University of North Texas Press. p. 14. ISBN 9781574411935. ^ "The Scoville Heat Measurement Chart". Wiw.org. Retrieved 2012-02-29. ^ "Selective Enzyme-Mediated Extraction of Capsaicinoids and Carotenoids from Chili Guajillo Puya (Capsicum annuum L.) Using Ethanol as Solvent". Oocities.org. Retrieved 2012-02-29. ^ "Salsa Garden cubit: Salsa Garden Pepper Database: Puya, Capsicum annuum (Hot Pepper)". Cubits.org. 2010-05-12. Retrieved 2012-02-29. ^ Hallock, Betty. "World's hottest pepper hits 2.2 million Scoville heat units". Los Angeles Times. Los Angeles Times. Retrieved 11 July 2014. ^ "Hottest chili". Guinness World Records. Retrieved 11 July 2014. ^ Paul Adams (7 July 2011). "FYI: What is the Hottest Pepper in the World?". Popular Science. Retrieved 12 October 2016. ^ Justin Bannister (2012-02-13). "NMSU's Chile Pepper Institute names the Trinidad Moruga Scorpion hottest pepper on earth". Retrieved 2013-11-26. ^ "How We Make Original Red Sauce | TABASCO® Products | TABASCO.com". TABASCO.com. Retrieved 2016-04-01. ^ "Which Chile Peppers are Which?". About Travel. Retrieved 5 February 2015. ^ "Rocoto Chili Peppers". Chile Pepper Madness. 2013-09-27. Retrieved 7 February 2015. G6CSY chile database: Used as source for information on various cultivars in this article. chillisgalore database: More can be found here.